2015 MARKS A significant year for provincial land policy in Ontario. Three of the key plans that impact farmland are expected to undergo a formal review process, giving farm groups the opportunity to speak up on concerns and recommendations. Land use planners, development professionals, municipal and provincial staff, and agricultural representatives recently met to discuss the current and potential future impacts of the plans at the 2014 Farmland Forum hosted by the Ontario Farmland Trust. “Our work to bring permanence to public policy on farmland is important given the fact that only five per cent of Ontario’s land can sustain strong agricultural production,” says Matt Setzkorn, Ontario Farmland Trust executive director. The Greenbelt Plan will celebrate its 10th anniversary in 2015 and, in addition to this standard 10-year review, the Niagara Escarpment Plan and Oak Ridges Moraine Conservation Plan are also due to be revisited. 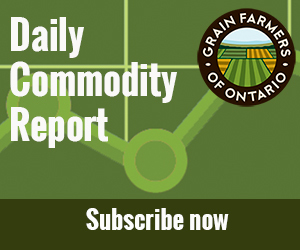 While each plan was established individually and each impacts a specific region of Ontario, Mark Wales, Ontario Federation of Agriculture (OFA) president, says they will be reviewed at the same time which allows comments to be provided at once. Leading up to the formal review procedures, farm groups have been active in collecting feedback from producers in specific areas who are impacted by the policies. Wales says he travelled across Ontario in March to meet with representatives from various county associations. “We reviewed the three plans and met with counties impacted by each policy to collect their thoughts and gain an understanding of what plan areas need improvement,” he says. Wayne Caldwell, director of the School of Environmental Design and Rural Development at the University of Guelph, has also recently completed a project specific to feedback on The Greenbelt Plan. Caldwell has co-authored the “Farming in Ontario’s Greenbelt: Possibility Grows Here” report which provides a collection of recommendations to ensure economic prosperity and viability of agriculture. Caldwell’s study involved consultations with farmers in the Peel, Durham, Halton, Hamilton, York and Niagara areas. He notes that throughout the information gathering process, participants expressed a variety of views on the Greenbelt ranging from optimistic to pessimistic. “My observations indicated that there are agricultural sectors within the Greenbelt doing very well and other sectors that are quite challenged,” he says. Peter Lambrick, director of the Golden Horseshoe Food and Farming Alliance, agrees and says he has seen livestock operations leave the Greenbelt since the plan was established. “It is becoming more apparent that the plans and interpretation of the plans can differ and this is an increasing challenge in agriculture,” says Lambrick. The research report also highlights inconsistent objectives between ministries, lack of understanding of agriculture on behalf of planners and other municipal staff, and the cost to farmers associated with meeting plan requirements as main issues identified by producers. While Caldwell’s report is now published, OFA is currently analyzing feedback from county associations as a first step to putting together review recommendations. Wales says they will be taking a policy position on a number of issues later this year, guided by strong themes within their feedback. He says one such issue is the future viability of the Niagara Escarpment Commission. Wales explains that the Niagara Escarpment Plan was established before planning at the municipal level existed. Now that almost all municipalities have official plans which meet the Commission’s guidelines, the question of whether the group is needed is a topic of discussion. “Overlapping regulations creating frustration is something that we have heard loud and clear through the feedback. We understand that farmers would strongly support a ‘one stop shop’ for planning approvals,” says Wales. With regards to OFA’s final recommendations that will be put forward in 2015, he says that their main objective will be to ensure the reviewed plans do not impede farming practices. “Preserving farmland is a strong theme within the plans but we also need to highlight the need for supporting active farmers,” he says. Specific to grain production, Wales does not see the plans impacting day-to-day field work but says that growers are more likely to be impacted in the area of expansion planning. “New buildings or expansion of buildings, grain drying set-ups, value-added expansions, and land clearing could trigger planning issues,” he says.